The increasingly successful series of ‘45 Minutes of Music @ the Meeting House’ resumes on 31st January. There are five monthly concerts on the last Wednesday (*except March) of each month from January to May, all start at 12 noon. (*March’s concert will be the penultimate Wednesday of the month.) Admission is free and everyone is welcome. 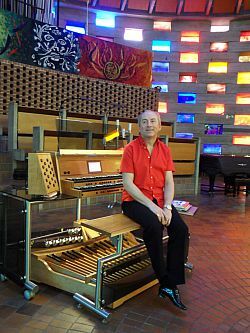 The series is performed by the internationally acclaimed concert organist and University Organist, D’Arcy Trinkwon, who is acclaimed as one of the outstanding virtuoso musicians of his generation. He is also Organist of Worth Abbey. These fascinating, relaxed and informal concerts include interesting verbal introductions from D’Arcy who explains details and background of each piece of music, thus making the music accessible to even those new to great organ music. The concerts are aimed to be interesting to everyone, and the audiences continue to grow – showing that they are! The organ in the Meeting House is one of the finest organs in the South East and is also one of the iconic instruments of its period. Built in 1966 by Grant, Degens and Bradbeer, its futuristic design still looks avant-garde today. 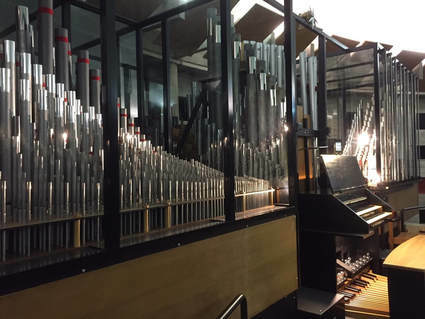 It was recently fully restored by Clevedon Organs with the addition of a very modern mobile console which allows the audience to watch everything the performer is doing and be totally involved and the performer to communicate fully with them. After the technical gymnastics and wizardry of the last series (‘Pedal Power – See what feet can do!’) we head on a fantastical journey exploring fantasias written for the organ over five centuries. As always, there’s a huge variety of music – from Elizabeth I’s time to the present. Musically a fantasia may be described variously as: a free musical composition structured according to the composer’s fancy, a musical composition with a free form and often an improvisatory style, or a a musical composition based on several familiar tunes and a thing composed of a mixture of different forms or styles. Concert dates: Last Wednesday of every month (*except March) from 12 noon for around 45 minutes. Admission to all these concerts is free; everyone is welcome.